Chatbots have a broad range of applications for travel, from planning and booking to customer service. To date, many travel bots have been fairly rudimentary. They are either stateless (i.e., they respond only to questions as asked and do not keep track of the conversation) or semi-stateful (i.e., they have some ability to keep track of what has already been said, but their recall is limited to the current conversation only). The exciting applications unfold when chatbots become stateful: capable of keeping track of the entire history of communication with the traveler. Privacy laws are likely to impact how companies can use personal data. However, with the customer's consent, this level of sophistication can enable personalized service and provide opportunities to delight travelers in a way that will make interacting with a computer rather than a person much more appealing. While more than half of travelers indicate they would be comfortable completing various travel-related activities via text or chat, they are somewhat less inclined to do so via chatbot (see figure below). However, the share of travelers who are comfortable with chatbots is not insignificant: four in 10 travelers indicate they would be comfortable chatting with a computer-powered assistant. Personalized interactions would likely help to tip the scales. 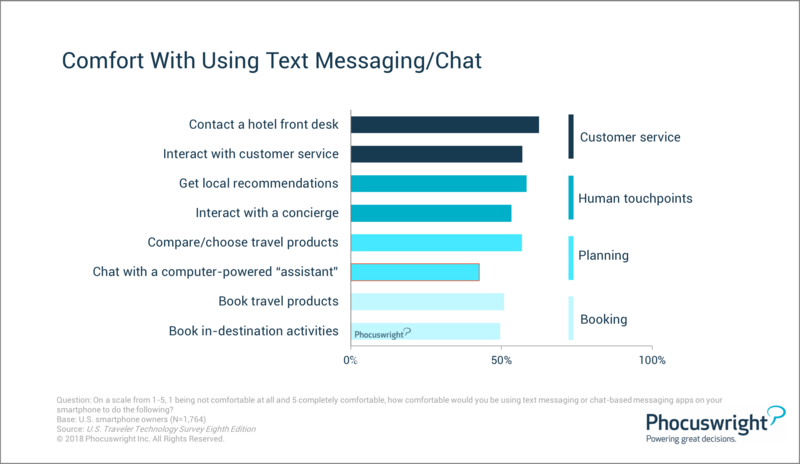 Numerous travel companies have tested the waters with chatbots, both via text interfaces and voice-based personal assistants. Startups, both B2C and B2B, have also emerged, focusing on chatbots and AI-based virtual assistants. The first wave of chatbots was an early step, and conversational interfaces – including text, voice, graphics and more – have a significant role to play in the future of travel. Phocuswright's article Bots: A Bright Future, or Destined for the Scrap Heap? surveys the technology that eventually will take chatbots from disappointing to dazzling and takes stock of the state of travel chatbots in 2018. To read the full article, subscribe to Phocuswright Open Access. Already a subscriber? Click here. Witness the latest applications of tech like chatbots at The Phocuswright Conference.Register today. Today, AI is touching the traveler directly and powering advanced analytics in back-end travel processes. Take a look at some of the applications and challenges along the traveler life cycle from Phocuswright's latest travel research.